Reading is so good for kids! I love this picture of my little granddaughter reading a book all by herself. I have a collection of books about holidays and seasons that I like to put out for my grandkids to read when they come to Gramma’s house! They like to read them and learn about all the fun activities and events associated with the different holidays and the changing season. Of course, it’s always a delight when they will snuggle up next to me and let me read them a story. Kid’s books are my favorite! I’ve been working on my collection of holiday books and trying to make sure I have one for every occassion. So far we have them for all of the major holidays but we’re still working on some of the smaller ones. My goal is to have a different set that I can put out every month. 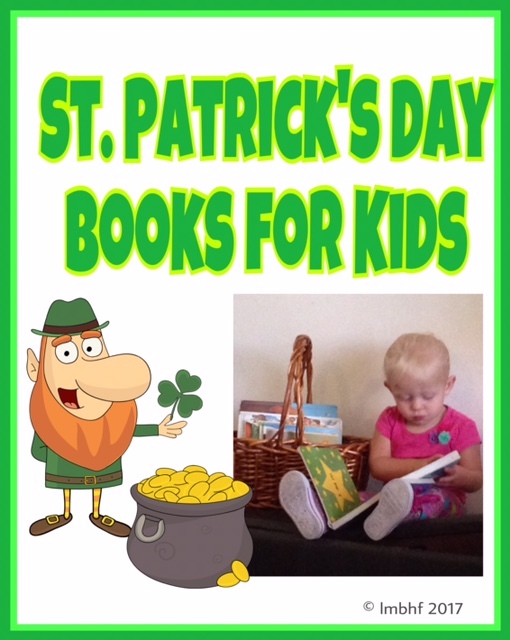 We don’t have one for St. Patrick’s Day yet so I did a little research and here are some of my top kid’s books finds. There are so many fun stories here. I haven’t quite decided yet which ones I want to get to add to my collection. Collecting a library of kid’s books for all of the holidays and seasons has been a fun activity for me and my grandkids. If you’d like to expand your library of children’s books you can click on the title or photos below and you’ll be directed to Amazon where you can purchase the featured story books. Kid’s Books – My Favorite Finds! 1. I met you at Grammy Dee’s blog party. 2. I’m an English teacher, so I appreciate you supporting literacy on your blog. 3. I will be celebrating St. Patrick’s Day too, tomorrow. I will be hosting a St. Patrick’s Day blog party for bloggers. I’d love it if you would come join us. 4. You mentioned at Grammy’s Meet and Greet that you were looking for something like that. Maybe you can check out my blog. In addition to offering blogging tips, I host ten networking events each month including two blog parties a month like Grammy had. Thank you Janice! I shared the post on your March 13th Linkup. Your blog looks fantastic! I’ll definately be back to check it out some more.